The wind industry likes to tell stories about wind power in Europe and make us in the United States feel that we are woefully behind our friends across the Atlantic, imploring us to catch up. The reality is that the European wind experience is increasingly colored by gross failure, economic problems related to unsustainable subsidies, curtailment of subsidies and citizen revolt. This section is thus what the U.S. wind industry does not want you to know about Europe. 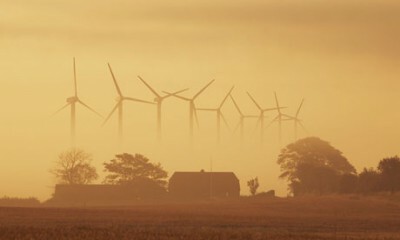 9/12/10 - Denmark to abandon future onshore wind farms in the country? Excerpt: "Although Germany’s promotion of renewable energies is commonly portrayed in the media as setting a “shining example in providing a harvest for the world” (The Guardian 2007), we would instead regard the country’s experience as a cautionary tale of massively expensive environmental and energy policy that is devoid of economic and environmental benefits." Bankrupt Europe has a lesson for Congress about wind power. The sound floats on the winds of Ka Le, this southernmost tip of Hawaii's Big Island, where Polynesian colonists first landed some 1,500 years ago. Some say that Ka Le is haunted -- and it is. But it's haunted not by Hawaii's legendary night marchers. The mysterious sounds are "Na leo o Kamaoa"-- the disembodied voices of 37 skeletal wind turbines abandoned to rust on the hundred-acre site of the former Kamaoa Wind Farm. From its beginnings as a slogan of the anti-nuclear movement, wind energy has always been tied to taxpayer support and government intervention. Wind farms got their first boost with the Carter-eraPublic Utility Regulatory Policies Act of 1978 (PURPA) which encouraged states to enact their own tax incentives. PURPA also for the first time allowed non-utility energy producers to sell electricity to utilities -- the first step towards a bungled half-privatization of electricity supply which would come two decades hence. Wind maven Gipe proudly takes a page from the disastrous European playbook, crediting himselfwith "Almost single-handedly launch(ing) a campaign for Advanced Renewable Tariffs (electricity feed laws) in North America." September 12, 2010 - Denmark to abandon future onshore wind farms in the country? It worked. Sunny Spain became the world’s top solar power producer. Since 2002, about €23-billion has been invested in Spain’s photovoltaic (PV) industry, which sucked up €2.7-billion in subsidies in 2009 alone, or more than 40 per cent of the freebies doled out to the country’s entire renewables sector. When the Spanish economy went into the toilet in 2008 and 2009, austerity measures were put into place. At first, it appeared the solar industry would be spared the worst of the cutbacks. That changed a bit, but only a bit, in November, when a royal decree reduced tariffs by up to 45 per cent on new PV plants; existing plants would remain untouched. Then – whammo! – a new royal decree landed with a thud just before Christmas. While it didn’t change the tariff, it retroactively limited the number of production hours that PV plants could qualify for the subsidies. Other European countries are also taking a long, hard look at their renewable energy sector and wondering whether it’s affordable. In December, the French government unveiled a plan for a three-month moratorium on new solar projects that are eligible for subsidized tariffs. The goal was to prevent a speculative PV bubble while it mulls new regulations for renewable energy. There is no doubt the replacement regime will be less generous. CRE, the independent regulator of the French energy and natural gas markets, recently estimated that taxes on electricity would have to almost triple to meet the rising costs of renewable energy. The question, of course, is whether rising energy taxes could kill more jobs than those created by renewable energy expansion. Germany is scaling back subsidies, too, and revealed another reduction a few days ago to households that generate electricity with their own solar panels. In the United States, where the incentives generally come in the form of tax credits instead of subsidized tariffs, the appetite for long-term support seems to be waning, partly because of the natural gas glut. Ditto in Canada. In Ontario last year, the average price for power was 3.7 cents per kilowatt hour. The feed-in tariff for solar installations ranged from 44 cents to 80 cents, that is, up to 20 times the market rate. (Ontario revised that higher end of the range downward to 64.2 cents last summer.) Watch the next Ontario government drain the renewable energy slush fund. Renewable energy is fraught with difficulties. In less-sunny climates, PV panels make little sense, though that hasn’t stopped Germany and Britain from installing them on rooftops everywhere. Wind power is becoming hugely popular in some parts of the world. But since the wind doesn’t always blow, backup power has to be installed. That means consumers have to pay for the capacity twice and the backup power is usually of the fossil-fuel variety. Denmark, which has a reputation as the cleanest of the clean countries, actually generates about half its electricity from coal, the grubbiest fuel. That proportion hasn’t varied in a decade in spite of the country’s relentless pursuit of wind power. The austerity programs have piled on additional difficulties in the form of subsidy reductions. No government would announce “temporary” subsidies, for fear of scaring off investment in renewable energy. Still, that’s exactly what the subsidies are turning out to be. Investors everywhere are going to get slaughtered as debt-swamped governments trim or eliminate the freebies. The ailing share prices of renewable energy companies such as Spain’s Iberdrola Renovables gives you an idea of the (waning) investor sentiment. Spain slashed payouts for wind projects by 35% while denying support for solar thermal projects in their first year of operation. This latest round of Spanish cuts followed announcements in November that payouts for solar photovoltaic plants would be cut by 45%. France announced a four-month freeze on solar projects and a cap on the amount of solar that can be built. These measures and others continue a retrenchment that saw industry payouts cut twice last year, and that will likely continue as opposition grows to France’s rapidly using power tax on electricity. The German government announced it may discontinue the solar industry’s sweetheart tariffs in 2012. This latest announcement follows a surprise reduction in 2009 and another reduction to start in 2011. According to the Global Wind Energy Council, the world now has 197 gigawatts of installed wind capacity with the largest amount in China (45 gigawatts), followed by the United States (40 gigawatts). Europe, led by Germany (27 gigawatts), has thelargest regional share of the total, 44 percent, followed by Asia with 31 percent. But the issue of much of this capacity is useable and benefiting the electricity grid and jobs is another question entirely. European countries have found that subsidies, set asides, and special treatment for renewables cost the country job losses in other sectors. Denmark, a country that generates 20 percent of its electricity demand from wind, can only use half that amount and must export the remainder to Norway and Sweden whose hydroelectric power can serve as a storage device. In the United Kingdom, wind farms were paid 900,000 pounds to disconnect their units for one night because the electricity was not needed. In China, the wind expansion was so great that many wind units were sitting idle because they were not connected to the grid. Add to that, noise pollution, property devaluation, frozen turbine blades, bird kills, and the cost of revamping the electric grid starts to make one wonder whether wind power was the correct course of action and what its future entails. Germany. Germany began its onshore wind expansion in 1997, instituting a feed in tariff to cover the higher cost of wind power that was 300 percent higher than traditional electricity costs. The highly subsidized wind market generated numerous investors who were guaranteed a market for 20 or more years and a high enough price to earn a profit. But, in 2008, German consumers were paying about 7.5 percent higher rates ( 1.5 cents more on a 20 cent per kilowatt hour household rate) and the abatement costs for carbon from wind generation were $80 a metric ton, four times the cost of carbon traded in the European trading system. Worse still, wind generally only produced about a fifth of its capacity. When its output rose to over 20 gigawatts on a windy weekend, grid connections to neighboring countries had to be shut down because they could not handle the additional power. Now that Germany has temporarily shut down some of its older nuclear units due to the nuclear accident in Japan, Germany has had to import power, principally nuclear power, from France and the Czech Republic. Certainly an ironic situation‚Äìwith domestic nuclear being unpopular, imported nuclear had to be used to keep the lights on. Germany is now moving its wind expansion to the offshore in an attempt to replace nuclear power. On May 2, 2011, Germany Chancellor Angela Merkel toured Germany’s first commercial offshore wind farm. The50-megawatt wind farm is located 10 miles north of the Darss Peninsula in the Baltic Sea. Because of rough conditions in the Baltic and North Sea and because of the difficulty of getting loans for a large wind farm due to its cost, offshore wind has not progressed as quickly in Germany as in other European countries. Germany would like to have 10,000 megawatts of offshore wind by 2020 and is planning to finance $7.4 billion in loans for the first 10 offshore wind farms despite its problems from subsidizing onshore wind. According to German think tank Dena, in order to integrate its renewable energy sources, Germany will need to spend at least $13 billion on new transmission lines, covering about 2,240 miles. Denmark. In 2009, a Danish think tank, CEPOS, published a study on that country’s wind industry, investigating reports of its 20 percent wind generation. The study found that while 19 percent of the country’s electricity generation was supplied by wind, wind only supplied an average of 9.7 percent of its electricity demand over a five year period. And, in fact, in 2006, wind generation only supplied 5 percent of demand. The country cannot use all the wind energy it generates since most of it is produced at night. Over an eight year period, West Denmark exported 57 percent of its wind generation and East Denmark exported 45 percent to neighboring Norway and Sweden, whose hydroelectric power can be easily switched on and off and can act as storage for the excess wind generation. United Kingdom. The United Kingdom joined the renewable power band wagon andVerso Economics assessed the impact. They found that for every renewable job created in the UK, 3.7 jobs were lost elsewhere in the economy. In 2009/2010, the cost to electricity consumers in the UK was $1.75 billion and in Scotland, it was $159 million. The Verso study was different than its predecessors in that it used an input-output model to generate its results. Environmental groups had criticized earlier studies for using methodologies other than input-output models. According to a recent study, wind installations in the UK produce wind power at only 21 percent of capacity. One factor for this poor performance is that Awind turbines in the UK freeze in the winter, suspending their generation and requiring the turbines to be heated, creating a demand for additional energy. And besides freezing temperatures, very high winds have caused the turbines to be turned off to prevent damage. Recently, the British have found that three of its older coal-fired power plants will need to be retired sooner than originally expected needing to turn to wind for its replacement power. The irony is that any one of the coal plants provides almost twice as much electricity as all of Britain’s 3,000 wind turbines put together. The contribution of the country’s wind mills during weeks of freezing weather last winter was minuscule, and during hot weather recently, the country had to import nuclear power from France since there was no wind power. Recently, wind operators were asked to turn off their wind turbines and were paid900,000 pounds to do so because there was insufficient demand. The payments were about 20 times the cost of the power they would have produced. Europe has pushed so hard and so quickly into renewable technologies with its subsidies, loans, and other incentives that it forgot to see if the electricity grid could handle it. According to Oxford University economist Dieter Helm, “Basically, governments have allowed the buildup of wind without thinking through the grid consequences. There are two responses: Stop wasting so much on the rapid development of wind and its questionable economics, or plough on regardless, in which case enormous grid investments are urgently needed.”Estimates are as high as $138 billion to upgrade the grid for onshore networks over the next 10 years. Noise pollution is also a problem. In Maine, for example, the current minimum setback is1.5 times the height of the tower, or between 582 and 615 feet for most projects. The setback distance is based on safety guidelines from the turbine manufacturer. But, folks affected would prefer a mile setback to keep people from being disturbed by the noise, the low-frequency sound pressure and vibrations that turbines and their blades make under various wind conditions. 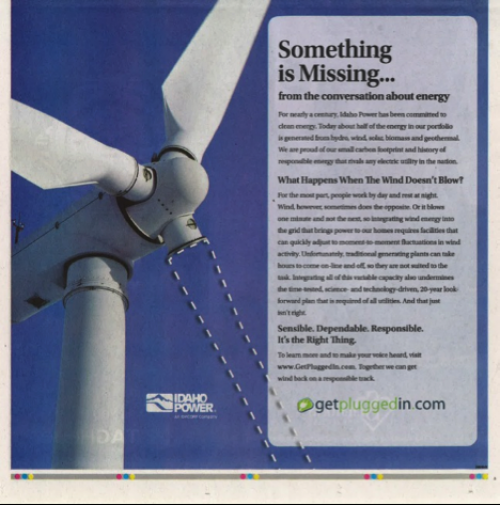 The ad below from Idaho Power points out issues with variable generation sources. Governor LePage: Wind Turbines Damaging Maine's Quality of Life and Mountains"
About 250 people turn out for his fifth Capitol for a Day event since his inauguration. ROCKPORT - Gov. Paul LePage talked about windmills, methadone clinics, taxes, child support and welfare programs Friday night before a feisty crowd of supporters and opponents. At his fifth Capitol for a Day town hall meeting since his inauguration in January, the Republican governor fielded questions at Camden Hills Regional High School. He was greeted by many people wearing "61%" stickers -- a reference to the percentage of voters who did not support him last fall -- and a strong contingent of supporters with LePage T-shirts and buttons. The crowd, estimated at 250 people, yelled back at LePage a few times, prompting his press secretary to remind the audience to be respectful. One exchange came early in the event, when a woman asked him why he doesn't think it is discriminatory to reduce welfare benefits for legal noncitizens. LePage said that, with limited resources, he wants to take care of Maine people first. When the woman yelled back that the immigrants are here legally, LePage responded by saying: "My answer stands. I will feed Maine people before I feed foreigners." After questions about why the state doesn't provide bus service or an expanded road system, state Treasurer Bruce Poliquin stepped in. "We have to make sure we realize our state is broke," he said. "We have no new money." A man yelled: "Raise taxes!" That prompted LePage to list statistics about higher incomes in nearby states. "We have the oldest state in the country," he said. "The highest number of people on fixed incomes. Sir, that's not the answer!" LePage's response prompted some to rise for a standing ovation. The governor was joined on the high school stage by several Cabinet members, including Pattie Aho, who was chosen by the governor Friday to be acting commissioner of the Department of Environmental Protection. While LePage spent much of the day traveling to Knox County businesses, he also vetoed three more bills. All were resolves that called for the Department of Health and Human Services to do studies or create programs. At the town hall meeting, LePage said he's working with DHHS Commissioner Mary Mayhew to make methadone clinics more effective. And he spoke of the need for the Legislature to pass tougher laws against domestic violence and deadbeat dads. "In the state of Maine, in the last two weeks, we had two children in the morgue, two mothers in the morgue, and two fathers who blew their brains out," he said. "The problem in the state of Maine is, the laws are too lenient. I tried to make changes and the Legislature didn't want to make them." When asked what he will do to reduce the state's dependence on foreign oil, LePage said he's concerned about a directive he received recently from the federal government regarding heating with wood. He said his daily briefing book included a message from the U.S. Environmental Protection Agency, warning that it may soon crack down on states that rely heavily on wood to heat homes. "That is one law, if the EPA put in, I will disobey," he said. LePage continued to criticize the state's wind power industry, saying windmills are hurting the state's quality of life. "They are doing an awful lot of damage to our quality of life, our mountains," he said. "I don't think it's going to lower the cost of energy. I think in 10 years we're going to be like Sweden and Denmark and we're going to be swearing at ourselves." The European Platform Against Wind farms (EPAW) is demanding “a moratorium suspending all wind farm projects and a “complete assessment of the economic, social, and environmental impacts of wind farms in Europe.” The EPAW said it objects to industrial wind farms which “are spreading in a disorderly manner across Europe” under pressure from “financial and ideological lobby groups,” that are “degrading the quality of life living in their vicinity, affecting the health of many, devaluing people’s property and severely harming wildlife.” A petition for a moratorium has been sent to the European Commission and Parliament, said EPAW chairman J.L Butre. The Netherlands has approximately 2,000 onshore and offshore wind turbines. But even though Holland is synonymous with windmills, the installed capacity of wind turbines in the Netherlands at large has been stagnant for the past three years, according to an article in February in the Energy Collective. It was 2237 megawatts (MW) at the end of 2011. That was said to be about 3.37 percent of total annual electricity production. The principal reason for the stagnant onshore capacity “is the Dutch people’s opposition to the wind turbines.” They are up to 400 feet in height. The Dutch national wind capacity factor is a dismal 0.186. The German wind capacity factor “is even more dismal at 0.167,” the article said. An added 3,000 MW of offshore turbines also was rejected. The capital cost was figured at $10 to $12 billion. The cost was judged to be too much and the wind energy produced too little. “The energy would have to be sold at very high prices to make the project feasible.” The article added, “The proposed Cape Wind project in Massachusetts is a perfect example of such a project.” Environmental Lawyer Robert F. Kennedy, Jr. in July wrote an op-ed piece in the Wall Street Journal blasting the project off Cape Cod as “a rip-off.” Recently, the Netherlands became the first country to abandon the European Union target of producing 20 percent of its domestic power from renewables by 2020. In Denmark, the Danes became aware that the poor economics of their heavily-subsidized wind energy is a major reason for the nation’s high residential electric rates. Opposition to the gigantic onshore turbines was so great that the state-owned utility finally announced last year that it would abandon plans for any new onshore wind facilities. The Energy Collective article also reported that a CEPOS (Center for Political Studies) study found that 90 percent of wind energy sector jobs were transferred from other technology industries and that only 10 percent of the wind industry jobs were newly created jobs. As a result, the study said, Danish GDP is $270 million lower than it would have been without wind industry subsidies. The Australian government, like the U.S., has placed a major emphasis on deploying renewable sources of energy, especially wind energy. As in the U.S.,Australia set a target of 20 percent of its energy to come from renewal sources by 2020. The government provides generous subsidies and tax breaks to wind energy developers. But medical studies on farmer families living within 5 miles of wind farms found health problems ranging from sleep deprivation to nausea. Similar health effects have been discovered in other locations, including in the U.S.
Onshore wind power today costs about $0.13 per kWh. That’s nowhere neareither the objective of the U.S. Department of Energy or the cost of competing power sources. The wind turbines jutting into the sky all across the country exist only because of the massive federal subsidies. Is this considered a failure by Obama officials? No way. Obama’s 2012 budget proposal increases renewables spending by 33 percent. Wind farms in Texas that will cost $400 million over the next two years produce, incredibly, an average of only one job for every $1.6 million of capital investment. So the state’s comptroller general figured, according to a December 20, 2010 story in the Austin American-Statesman. As long ago as 1973, then- President Nixon called for “Project Independence” in reaction to the OPEC oil embargo. The project was to achieve energy independence through development of alternative energy sources, such as wind, solar and geothermal power. So, there’s nothing new about renewable energy. The Obama 2012 budget asks for $8 billion for “clean” energy, mainly wind power subsidies. As recently as Feb. 7, the secretaries of Energy and Interior announced plans to launch dozens of offshore turbines miles out at sea, while admitting the expense would be unknown. Despite generous subsidies, wind power is expected to provide no more than 8 percent of electric power in the U.S. by 2030. The American Wind Industry Energy Association, the wind lobby group, said the top five states for wind energy were Texas, Iowa, California, Minnesota, and Washington. It said the second quarter of 2011 saw over 1,033 megawatts of capacity installed. It also maintained that wind is second only to natural gas and U.S. wind power represents more than 20 percent of the world’s wind power. Over the next half century, say, it’s possible some new technologies will revolutionize energy. But, if so, they surely will come from the private sector — not government. Posted Oct. 04, 2011, at 5:26 a.m.
Last modified Oct. 04, 2011, at 5 p.m.
ORONO, Maine — European officials are looking to the University of Maine’s offshore wind efforts to boost the amount of wind power produced on the continent and to ease public distaste for wind turbines. Officials from Italy, Germany and Norway visited UMaine’s Offshore Wind Laboratory on Tuesday to get a preview of plans to install a 500-megawatt floating wind turbine farm in the Gulf of Maine by 2020. The six delegates represent the Organization for Economic Cooperation and Development, a Paris-based international group that studies and tries to push forward social, economic and environmental changes worldwide, according to Raffaele Trapasso, a group representative from Italy. The debate over wind turbines in Europe is decades old, Trapasso said. “Landscape has a high value over there,” Trapasso said. But with decades of wind development onshore, the public eventually started turning against turbines, complaining that the aesthetic costs were too high. So European nations led the push to take wind farms off the land and put them offshore. The first offshore wind turbine farm on the planet was finished in Denmark in 1991. But those turbines had to be in shallow water so the base could be embedded into the sea floor. That meant people in coastal areas could see the turbines, which led to complaints that business, tourism and the economy in general were being hurt, according to Trapasso. Turbines have grown more efficient over the years, producing more energy at less cost, but installing new turbines is difficult or impossible in many parts of Europe because the public has turned against them, Trapasso said. The solution: out of sight, out of mind. After the Organization for Economic Cooperation and Development heard about the DeepCwind Consortium, a collaboration of UMaine and several private companies attempting to get offshore wind farms floating, it decided to send representatives to find out more. The organization, which represents 34 countries, also sent officials to examine energy and economic projects in Vermont, Illinois, Iowa, Kentucky, Oregon, Tennessee and Washington, D.C.
By putting the turbines on a floating “footprint,” or base, DeepCwind plans to anchor them in much deeper water more than 20 miles offshore — well out of view from the coast. It’s an answer to a longstanding problem in Europe that Trapasso said he will take back with him. It might not be a perfect solution, he said, because the European public still has many of the same worries that are echoed by Maine’s offshore wind opponents: How will the turbines affect sea life and fisheries? How will energy be brought back to shore? How will the turbines hold up in rough weather? UMaine has studied these questions closely, according to Habib Dagher, director of the DeepCwind Consortium and Advanced Structures and Composites Center. DeepCwind hopes to have a 100-turbine farm in the Gulf of Maine around 2020. The turbines would be anchored in an area that would have a minimal effect on the fishing industry. Testing on small-scale models has indicated that the turbines won’t have a problem holding up to high winds or rough seas. More testing will take place at the Offshore Wind Laboratory leading up to the deployment of a one-third scale model floating wind turbine in April 2013. Just last week, Dagher received approval to place the test turbine about 2½ miles south of Monhegan Island, he said. The test turbine will be built by Cianbro and assembled at Bath Iron Works before a tugboat tows it down the Kennebec River — at about 2 mph — to its new home off the island. The trip will take 10 hours, according to Dagher. After testing, the project will be scaled up over the next 10 years, with bigger turbines and larger numbers, until the full-scale turbine farm is completed. Dagher said he was pleased to see that the university’s wind development efforts were drawing international interest. The launching pad of the windfarm invasion is a mountain of public funds. If you withdraw the subsidies, the wind industry will collapse. If we want to go for the throat, we must denounce these subsidies. Now is the time to do it, because they are contributing in no small measure to the budget deficits of EU countries, to their sovereign debts, and to the crisis of the euro. This in turn causes governments to make drastic cuts in social benefits. If the public knew that windfarms are hurting their wallets this way, the wind monsters would be a lot less popular. We have thus decided to denounce publicly the fact that Greece and Spain (implying Italy, Ireland, and Portugal as well), continue to increase their sovereign debts by financing with public funds economically inviable "green" energy projects. What this means is that the countries that collectively guarantee these sovereign debts, and who just paid billions of euros to save Greece, must tighten their own social belts to allow the profligate countries to continue spending money they don't have on windfarms and other expensive and inefficient projects. To denounce this is to hit our enemy where it most hurts. It is therefore what we must do. The president of Iberdrola, Ignacio Sánchez Galán, declared Thursday in Madrid that the brakes should be applied on the development of thermosolar energy in Spain, because it is "economically inefficient".He warned that this immature technology may create “a new bubble” similar to that of the photovoltaic, with a cost to the Spanish consumers of €2 billion annually (1). "Someone has to pay for the green fiesta”, he warned at a conference attended by analysts. He added that the amount of public funds spent to support green technologies “makes the Spanish MWh the most costly in the whole of Europe”. The European Platform Against Windfarms (EPAW) remarks that, like Greece, Spain continues to squander on uneconomic energy projects money it doesn’t have. The Iberian country has conveniently placed off-budget € 22 billion's worth of "deficit tarifario", or green energy deficit, which nevertheless needs to be financed by sovereign debt. EPAW has learned that the Saudis have been invited to finance it, but no details have been released regarding State guarantee or other security being offered. “What's most worrying is the lack of transparency", says Mark Duchamp, EPAW’s CEO. What kind of deal is being offered to the Saudis, he asks? Like the Chinese, who are being asked to fund the European Financial Stability Facility, it is unlikely they will lend billions on an unsecured basis, or without important perks. They've seen the German and French banks bite the bullet on Greek debt, now worth to them 50 cents on the euro. "What is being offered that we don't know?" wonders Duchamp. "Having sold its furniture to pay for decades of public overspending, are the EU governments now mortgaging the European house to be able to continue wasting away money that we don't have on uneconomic renewable energies?" EPAW has been provided with scientific proof that "the most mature" of the green technologies, wind farming, doesn't actually save on C02 and fossil fuel imports. "More on that next week", adds Duchamp. The North American Platform Against Windpower (NA-PAW) comments along the same lines. Says her CEO, Sherri Lange: "The United States and Canada are following the European model. It would be wiser to watch and learn, instead of jumping on a bandwagon that's headed for the cliff." Mr Wilmar said: “I suggested to him to put them on his estate, and he said, 'You stay away from my estate young man’. rational argument — that uses reason and evidence — to gore a sacred cow of the environmental movement. There are many to choose from: the idea that wind power is good for the climate, or that biofuels are good for the rain forest, or that organic farming is good for the planet, or that climate change is a bigger extinction threat than invasive species, or that the most sustainable thing we can do is de-industrialise. Spanish renewable-energy companies that once got Europe's biggest subsidies are deserting the nation after the government shut off aid, pushing project developers and equipment-makers to work abroad or perish. From wind-turbine maker Gamesa Corp. Tecnologica SA (GAM)to solar park developer T-Solar Global SA, companies are locked out of their home market for new business. These are the same suppliers that spearheaded more than $69 billion of wind and solar projects since 2004 that today supply more than 50 percent of Spain's power demand on the most breezy and sunny days. Saddled with a budget deficit more than twice the European Union limit and a ballooning gap between income and costs in its power system, Spain halted subsidies for new renewable-energy projects in January. The surprise move by Prime Minister Mariano Rajoy one month after taking office helped pierce investor confidence in stable aid for clean energy across Europe. "They destroyed the Spanish market overnight with the moratorium," European Wind Energy Association Chief Executive Officer Christian Kjaer said in an interview. "The wider implication of this is that if Spanish politicians can do that, probably most European politicians can do that." Spain's $69 billion of investment in power capacity from 2004 to 2011 was about triple the spending per capita in the U.S. in that period, according to Bloomberg New Energy Finance data and U.S. Census Bureau population estimates. Most of the 2012-2013 spending will be for the legacy of projects approved before the aid cuts to wind, solar, biomass and co-generation. Investment in solar photovoltaic alone is headed to skid to as little as $107 million in 2013 from $879 million this year and $1.5 billion last year, New Energy Finance estimated. For new wind projects, investment should plunge to $963 million in 2013 and $244 million in 2014 from $2 billion this year. T-Solar, which became the world's biggest solar-farm operator by leveraging its Spanish business, currently has more than 40 running in Spain, Italy and India. While it still makes solar panels in Orense, Spain, they're bound for Peru. "We have an important pipeline of projects, and it's 100 percent outside Spain right now," T-Solar Managing Director Juan Laso, who also heads the country's photovoltaic power association, said in a telephone interview. "If you take such a brutal measure, what you do is oblige the industry to move out," he said of the January moratorium. Gamesa, the world's fourth-biggest wind-turbine maker by market share according to Navigant Consulting Inc. (NCI)'s BTM Consult unit, plans to reduce the factory output of its Spanish plants to 1,000 megawatts by 2013 from 1,200 megawatts at the end of last year. Instead, Zamudio-based Gamesa is adding capacity in India where it plans to open a third factory this year. In 2011, the company got less than 9 percent of its revenue in its home nation, down from almost 33 percent in 2009. Former CEO Jorge Calvet didn't mention Spain on a May 10 call with analysts after announcing the company's first quarterly loss. "The future is outside of Spain," said Sean McLoughlin, clean energy analyst at HSBC Bank Plc in London. "Gamesa already moved most of their business out of Spain and the moratorium only helps to accelerate and complete that process." Thirty-one years ago, Spain erected its first wind turbine at Tarifa, a city on the peninsula's southern tip that juts into the gusty Straits of Gibraltar which divide Spain from Morocco. In the 2000s, Spain copied the German clean-power aid model, as did nations from Portugal to Israel and Japan, increasing subsidies to a pinnacle in 2007. That's when a law granted 444 euros ($556) a megawatt-hour for home rooftop solar panels feeding the power grid, compared with an average 39 euros paid to competing coal- or gas-fired power plants. By 2009, the consumer bill for clean-energy aid had risen to 6 billion euros a year, ahead of the 5.6 billion euros in Germany, whose economy is almost four times bigger, according to the Council of European Energy Regulators. After four successive reductions in subsidies since then, the government on Jan. 27 this year announced the moratorium on aid for new projects. The next month Spain saw itself drop out of the 10 most attractive markets for renewable-energy investors for the first time, due to reduced aid, on an Ernst & Young ranking. Spain led the list from October 2003 through July 2006. "What happened in Spain is that abruptly, they changed the industry by changing the policy, and that doesn't help build a sustainable industry," said Stephan Ritter, general manager of General Electric Co.'s European renewables unit. "The history of Spanish wind energy policy is ‘We're going to keep it stable' and suddenly out of the blue this comes, and it's a bomb," the EWEA's Kjaer said. The decline started before this year. The 75,466 renewable energy jobs that existed in Spain at the industry's peak in 2008 shrank to 54,925 in 2010, according to the Renewable Energy Producers Association's most recent data. Including indirect jobs, the tally slumped from 131,229 to 111,455. Iberdrola SA (IBE), based in Bilbao, became the world's biggest owner of wind farms, taking its Spanish experience abroad over the past decade. It campaigned for solar subsidies to be ended, because much of the power-tariff deficit sits on the utilities' balance sheets straining their finances. Iberdrola, which also runs gas, hydro and nuclear plants, is Spain's biggest utility. Solar energy was the biggest drag on the system, accounting for almost half of the annual 6 billion euros of liabilities and producing just above 2 percent of the power, said Eduardo Tabbush, an analyst in London at Bloomberg New Energy Finance. With peak electricity demand at less than half of capacity, the country doesn't need more power plants, he said. Spain has a capacity of 99 gigawatts, and peak demand of 44 gigawatts. Spain's power-system debt swelled to 23 billion euros as successive governments set electricity prices for consumers that didn't cover the revenue utilities booked. Even with January's moratorium, the electricity system racked up another 762 million euros of debt in the first two months of the year, according to the energy regulator. "You're making renewables a scapegoat for a problem that was created as a result of incredibly bad policies," said Kjaer. Spain is the world's fourth-biggest wind energy market by cumulative installed capacity, and in solar photovoltaic power, it ties the U.S. for fourth, according to data compiled by Bloomberg. The nation installed at least a gigawatt of wind power capacity every year since 2001, peaking at 3.5 gigawatts in 2007, according to the Spanish Wind Energy Association. "At the moment there's not a single project planned for 2013," Heikki Willstedt, director of energy policy at the Spanish Wind Energy Association, said in an interview. "We have to keep a rhythm of installation over the next two or three years to keep the industry here in Spain." Solar power installations have been bumpier, totaling 550 megawatts, 2,760 megawatts, 70 megawatts, 390 megawatts and 430 megawatts for the five years through 2011, according to Bloomberg New Energy Finance data. Even before the moratorium was established, opportunities were dimming for renewable power in Spain. The so-called pre- registry of wind projects, which had been approved to receive above-market electricity prices, was set to expire at the end of 2012. And a retroactive cap was set on the number of hours when solar generators can earn higher rates. Acciona SA (ANA), a developer of wind and solar projects that in 2011 derived more than three quarters of electricity sales in Spain, has less than half of its pipeline of new projects for 2012 in Spain. Energias de Portugal SA's renewables division, based in Spain, has less than a fifth of its pipeline there. At Abengoa SA (ABG), the portion of revenue from Spain fell to 27 percent last year from 39 percent in 2007. Abengoa has 1,210 megawatts of solar thermal plants either in construction or in a pre-construction phase, a third of it in Spain. "It reaches a point where if more interesting markets open up and you have to export to those markets, many times it's better to take the factories there," said Willstedt. "All of this know-how could be lost quickly, or it'll move away, or it could be bought by competitors." In a country where unemployment in April rose to 24.4 percent, the subsidy moratorium puts more positions at stake, according to Willstedt. In its March 30 budget, Spanish Premier Rajoy's government gave no sign of when it would bring back subsidies, and the National Energy Commission, an advisory body, has published scenarios including a suspension until 2017. "I don't know any sector that can be put on ice for 5 years and then be taken out intact," said T-Solar's Laso. Abengoa Chief Executive Officer Manuel Sanchez Ortega said Feb. 28 in an interview he thought the moratorium would last 18 months at the most. "Then the industry will pick up the pace again," Ortega said. "If it lasts more than 18 months we are running the serious risk of driving all this industry out of the country." Spain and Germany increased reliance on wind power, have recently cut subsidies or reversed course. U.S. should look to Europe's renewable energy failures when considering future energy policies. Wind power's higher prices could cost us jobs. When Germany decided to close down its nuclear power stations after the Fukushima disaster in Japan, the original plan was to replace most of the lost generating capacity with wind power. However, wind power is expensive, and the growing size of the industry has meant that subsidies – and energy bills – have surged. The German subsidy is paid for by a surcharge on household electricity bills. The growth in wind power meant that in January the surcharge increased to over 5 cents (euro) per kilowatt hour,representing 14% of all electricity bills. In Germany, Chancellor Angela Merkel, realizing that wind power is economically unsustainable, has proposed capping the subsidy until the end of 2014 and capping further rises to 2.5%, with the probability of further significant reform after the federal elections this year. It's a similar story in Spain, where subsidies have been cut so much that the chairman of the country´s Association of Renewable-Energy Producerssaid recently: "Spain's government is trying to smash the renewable-energy sector through legislative modifications." President Obama has repeatedly said we should look to Spain and Germany for the lead on renewable energy policy. He is right, but not in the way he thinks. Furthermore, he should look to the Cape Wind project in Nantucket Sound. The project will cost $2.6 billion, and it has secured funding for $2 billion of that from a Japanese bank. But this is believed to be subject to the project gaining a loan guarantee from the U.S. Department of Energy. And there is every reason to believe that this would be as bad a bet as its loan guarantee to Solyndra. The contracted cost of the wind farm's energy will be 23 cents a kilowatt hour (excluding tax credits, which are unlikely to last the length of the project), which is more than 50% higher than current average electricity prices in Massachusetts. The Bay State is already the 4th most expensive state for electricity in the nation. Even if the tax credits are preserved, $940 million of the $1.6 billion contract represents costs above projections for the likely market price of conventional power. Moreover, these costs are just the initial costs, and like in Germany, they are scheduled to rise by 3.5 percent annually for 15 years. This massive increase in energy costs is bad news for Bay State businesses and may well drive some of them out of the state entirely. That's a disaster for jobs and for tax revenue. The likelihood that businesses will not be willing to pay the bill means that the burden will fall increasingly on households. Yet, in all probability, this will be politically unsustainable, and the cost will therefore fall back on taxpayers across the nation, via the loan guarantee. That's just the economic argument. When you consider the environmental arguments, the case becomes a no-brainer. As the Alliance to Protect Nantucket sound points out, "Cape Wind threatens the marine environment and would harm the productive, traditional fisheries of Nantucket Sound." The Alliance also notes that, "Cape Wind would not make a significant contribution to the effort to reduce pollution emissions, and, in fact, could aggravate the problem by causing dirty power plants to run more often in order to be ready to generate power instantly when the wind stops blowing." For the Department of Energy to grant the loan guarantee to Cape Wind would be a triumph of blinkered ideology over real economic and environmental concerns. The president, true to his word, should learn from Germany and turn down the loan guarantee to Cape Wind. Energy insiders have long known that the notion of viable ‘renewable energy’ was always a romantic proposition – and an economic bust. But it is amazing what the lure of guaranteed ‘few strings’ attached government subsidies can achieve. Even the Big Oil companies bought into the renewables revolution, albeit mostly for PR reasons. Like Shell, however, many quickly abandoned their fledgling renewable arms. Post-2008, they knew, the subsidy regimes could not last. Neither was the public buying into the new PR message. Now it was just a question of time before Europe’s world leading pioneers of solar and wind power, Germany and the UK, decided they had had enough of the self-inflicted economic pain. And all the signs are, as Germany’s solar sector just went belly up and the UK is made aware of how much every wind job actually costs, that the slow implosion of the renewables revolution is under way. The plain fact is that installing solar panels, especially in the northern hemisphere, makes about as much economic sense as Iran heading up a UN Human Rights Commission (which they have done by the way). Equally, the viability of windfarms has always been the renewables industry’s worst kept secret. But, aided by aggressive and heavily funded green lobbies, leftist social engineers, appalling journalism, naive politicians and unscrupulous opportunistic renewable energy entrepreneurs, wind turbines and the photovoltaic industry quickly became established facts on the ground, giving the appearance of economic ‘viability’. Why else would government back them using our cash? I have written before about ‘Hamish’ who is convinced that his wind turbine investment offers him some ‘free’ energy. ‘Free’ so long as you overlook the double-whammy of ‘front end’ feed-in tariffs and other green levies and the ‘back end’ high energy bill tariffs pass on by the power companies to others now forced to buy Hamish’s electricity at above market prices. And that’s before you consider Hamish’s maintenance costs, his need for hydrocarbon back-up, intermittent and unreliable generation, not to mention that the power company cannot store his product which may never be used. Oddly, Hamish is a radical green socialist who bought his turbine to benefit society. It never once occurred to him how his green extravagance was subsidized via hiked energy bills that forced thousands into fuel poverty. Not much social conscience there. Let’s get it straight once and for all, wind and solar power is never ‘free’ however it may appear to the micro-scale domestic entrepreneur. Just like any resource, someone, somewhere has to pay to develop, utilize and distribute it. If the sole criteria is that wind and solar are free, you might as well say the same applies to oil and gas. And that brings me to the latest macro-scale renewable energy disasters. In Europe, Germany was a major green pioneer, especially regarding solar energy. The UK, being the windiest country in Europe, focused on wind power. In both countries, however – to mix metaphors – the wheels are fast coming off. In June, the sun finally set on Germany’s solar sector with power companies, large and small investors seeing their £21 billion investment in solar energy disappear into the ether. As one German commentator wryly observed, “the sun does send an invoice after all”. In mid-June the German company Siemens announced it was winding down its solar division with a view to shutting down completely by next spring. Siemens had entered the solar thermal systems market when it bought the Israeli company Solel, believing market growth would be rapid. The gamble failed. Siemens lost around one billion euros. In March, Bosch signalled its withdrawal from the solar cell and solar module market. Bosch board chairman Franz Fehrenbach, who had been behind the company’s push into solar energy since 2008 has further admitted that the German solar sector generally is “doomed to die”. Bosch will lose even more than Siemens, probably around €2.4 billion. But it is the private investors who bore the full tbrunt of the loss as the former hot shots of the stock exchange Germany’s SolarWorld and Q-Cells, among other solar companies, lost tens of billions in capital investment. Meanwhile, in the UK, wind power is again making the headlines, but for all the wrong reasons. A new analysis of government and industry figures revealed that every UK wind industry job is effectively subsidized to the tune of £100,000 per year. In some cases it rises to £1.3 million per job. In Scotland, with its 230 onshore windfarms, the figure is £154,000 per job. Even if the highly optimistic maximum projection of 75,000 wind industry jobs by 2020 is realised the figure would only drop to £80,000. But, as the Renewable Energy Foundation, a UK think-tank, has pointed out, to meet its EU obligation of providing 15 percent of its generated energy from renewable sources by 2020 – a ridiculously untenable goal – the lavish subsidies will need to rise still further to £6 billion per year. Neither do the figures take into account the cost to the country of an exodus of energy-intensive industries; a very real threat if green levies on energy bills continue to rise. European industry and power stations have already turned to burning millions of imported tonnes of American wood pellets in a desperate bid to keep costs down. And that, as has been reported, is to the detriment of fine forests in the US and a resultant impact on CO2 levels. The attraction of a quick buck when government slush-fund subsidies are on offer has always attracted entrepreneurs, corporate industry and investors alike. The trouble is that lavish subsidies will always be subject to what our Gallic friends would call: Le Guillotine. There’s a cut off point – and its fast approaching. In many parts of northern Europe, wind and solar projects may be highly visible facts on the ground. But the headline economic fact behind renewable energy is, and always has been, its sheer and blatant “unsustainability”. This is worth noting given how the wind industry and their sock puppets at the so called and on-the-take environmental groups in Maine like to cite Denmark as a shining role model of wind power. DONG is 76% owned by the Danish government. ""Every time we were building onshore, the public reacts in a negative way and we had a lot of criticism from neighbours," said a spokesman for the company. "Now we are putting all our efforts into offshore windfarms." will be employed by the purchasing company going forward. be focusing on offshore wind in the future. further step towards the realisation of our strategy and financial action plan. Poulsen, CEO of DONG Energy. expected investment level for 2013-2014. Germany's energy portfolio may not be as green as you think, Grealy writes. Coal-fired power plants made up 52 percent of Germany's electricity demand in the first half of 2013, while output from natural gas and wind turbines is falling. Steam billows from the cooling towers of Vattenfall's Jaenschwalde brown coal power station behind wind turbines near Cottbus, eastern Germany. is a shale gas consultant and publisher of No Hot Air, a forum on energy issues published from Britain that follows the emergence of shale gas around the world. For more of his insights, click here. Gas prices expected to soar. What gives? Coal-fired power plants contributed 52% of Germany's first-half electricity demand as output from natural gas-fired power plants and wind turbines fell, research organization Fraunhofer Institute (ISE) said. Coal plants increased production by about 5% to 130.3 TWh in the first six months of 2013 as output from gas-fired power plants fell 17% to 21.9 TWh, said ISE, which collated data from Germany's statistical office and the EEX transparency platform. It is one of the finest achievements in public relations in history. Germany has managed to be praised by environmentalists more than any other developed nation and yet is building more coal plants than more or less any other developed country. If China is watching on they should take note. The easy way to receive the adulation of Western Greens is to put up a stack of solar panels, and to just keeping building coal plants as before. Just think of the headlines: “China gets 50% of its electricity from solar power.” The green adulation will be remarkable, yet the carbon emissions will keep soaring. If you like me you'll love Robert by the way, and he's an actual scientist to boot, he deserves more readers. The essential problem in Germany is complicated, which explains why the simple narrative of saying solar is 50% of power, which isn't the case at the July midday time of writing today anyway, gets the exposure. German gas prices have the strongest link to Russian oil indexed prices. The link continues in no small part thanks to the German horror of fracking, despite it happening in Germany since the 1950s. Throw in the dysfunctional carbon market and add megatons of US coal displaced by lower US gas prices and we have baseload power, the stuff that actually keeps the streetlights on, coming from nuclear and coal. But there is so much subsidised solar generation, in a country not known for it's low latitude or sunshine, that solar, effectively free, provides much of the peak capacity during peak daylight business hours. That means that gas provides the extra power needed at shoulder periods in the 0700 to 0900 and 1700 to 1900 peaks. Wind turbine output fell 10% to 22.4 TWh, while solar output was unchanged at 14.3 TWh. Hydro output rose 3% to 9.2 TWh, with nuclear output up 1.8% to 46 TWh. Hydro output rose, but then again so did the calamitous floods of early this year. Whether they were the result of global warming from increased CO2 production is up to you. But next time Mark Ruffalo or Josh Fox or the UK Friends of the Earth hold up Germany as an example of the way forward, let some facts intrude. Energiewende? This is an Energie Katastrophe. Not only for Germany, but for the rest of us who all share the same sky. If Germany’s green energy revolution – the “energiewende” – proceeds as planned, the price of electricity in Germany will increase by upwards of 20%, according to government estimates. By 2020, Germany’s green energy program will increase production of wind power from 31,000 to 45,000 megawatts (MW). In 2013, electricity from renewable energy will cost German consumers about $26 billion, a considerable premium compared to the cost of electricity generated by nuclear power plants and fossil fuels. For society as a whole, the costs have reached levels comparable only to the euro-zone bailouts. This year, German consumers will be forced to pay €20 billion ($26 billion) for electricity from solar, wind and biogas plants -- electricity with a market price of just over €3 billion. Even the figure of €20 billion is disputable if you include all the unintended costs and collateral damage associated with the project. Solar panels and wind turbines at times generate huge amounts of electricity, and sometimes none at all. Depending on the weather and the time of day, the country can face absurd states of energy surplus or deficit. Once the power has been shut off, it's difficult to have it switched on again. Customers have to negotiate a payment plan, and are also charged a reconnection fee of up to €100. "When people get their late payment notices in the spring, our phones start ringing," says Becker. In the near future, an average three-person household will spend about €90 a month for electricity. That's about twice as much as in 2000. Lawmakers, on the other hand, have largely ignored the phenomenon. In the concluding legislative period, the government and opposition argued passionately over a €5 increase in payments to the long-term unemployed. But no one paid much attention to the fact that those welfare recipients would subsequently see the extra €5 wiped out by higher electricity bills. It is only gradually becoming apparent how the renewable energy subsidies redistribute money from the poor to the more affluent, like when someone living in small rental apartment subsidizes a homeowner's roof-mounted solar panels through his electricity bill. The SPD, which sees itself as the party of the working class, long ignored this regressive aspect of the system. The Greens, the party of higher earners, continue to do so. Germany's renewable energy policy is particularly unfair with respect to the economy. About 2,300 businesses have managed to largely exempt themselves from the green energy surcharge by claiming, often with little justification, that they face tough international competition. Companies with less lobbying power, however, are required to pay the surcharge. In this respect, at least, all of Germany's political parties are pushing for change. They want to close loopholes and more widely distribute the costs of clean energy subsidies. But even this improvement would translate into a relatively minor financial benefit to citizens. According to the SPD plan, an average household would see only about 70 cents a month in savings -- slightly less than under the plan Environment Minister Altmaier proposed a few months ago. In the end, what actually drives up costs would remain unaffected: the haphazard expansion of wind and solar energy. Far out in the North Sea, about 70 kilometers (43 miles) from the island of Norderney, there is a large, bright yellow steel box. It's as wide as the Brandenburg Gate and taller than the Federal Chancellery building. It's essentially a giant electrical socket, which collects the electricity from the nearby offshore wind farms and transmits it to the mainland via a thick cable. The system, along with the cable, cost grid operator Tennet about €1 billion and is designed to last 20 years, although there is no data to show that this will actually be the case. According to an official at Tennet, the company has no experience with such systems. It knows only one thing: There are always obstacles in the way. In the case of Germany's offshore projects, those obstacles currently include weather and porpoises. In heavy seas, work on the wind farm is suspended. The same applies when porpoises and their young are spotted, because of the potential damage to their sensitive hearing by construction noise. As a result, there are still many spots where metal stumps protrude from the water instead of wind turbines. Still, the government is pressing ahead with wind expansion, and the plans are breathtaking. By 2020, offshore wind turbines are expected to generate up to 10 gigawatts of electricity, theoretically as much as eight nuclear power plants. To attract investors, the government has created the best possible subsidy conditions, so that operators will be paid 19 cents per kilowatt-hour of offshore electricity, or about 50 percent more than from land-based wind farms. The government has also assumed the liability risk for the wind farm operators. If anything goes wrong, taxpayers will bear the cost. As fascinating as the plan is for engineers, economically it's a potential disaster. Experts believe that because of the more challenging conditions, the power offshore wind turbines generate will be consistently two to three times as expensive as on land. Although the wind blows more consistently at sea, this comes far from offsetting the higher costs. The less visible costs are also high. There is little demand for electricity in the thinly populated coastal region. New high-voltage power lines will be needed to transport the energy to industrial centers in western and southern Germany. The government already estimates the costs of expanding the grid at €20 billion, which doesn't include the additional ocean cables for offshore wind power. If the government sticks to its plans, the price of electricity will literally explode in the coming years. According to a current study for the federal government, electricity will cost up to 40 cents a kilowatt-hour by 2020, a 40-percent increase over today's prices. Worse yet, it remains completely unclear whether the offshore facilities are even needed. The Federal Environment Agency believes it's enough to install modern turbines in the best terrestrial wind sites. It would also be cheaper. But even if that were the case, the environment minister still believes consumers can expect to see rising prices. Experts say the miniscule impact wind energy has had on current prices is due to an uncooperative Mother Nature: 2013 has been an unusually windless year so far. The Cossebaude reservoir is Dresden's largest and most popular open-air pool. On summer days, up to 8,000 sunbathers lounge on its sandy beach or cool off in the 10,000-square-meter (2.5-acre) lake. Cossebaude is also part of the enormous Niederwartha pumped storage hydroelectric plant. At night or on weekends, when there is plenty of available power, lake water is pumped electrically through big pipes into a second reservoir 140 meters above the main reservoir. At noon, when electricity is scarce, the water is released from the higher-elevation reservoir, spinning giant turbines as it descends. The system generates electricity when the cost is high and consumes it when the cost is low. Plant operator Vattenfall makes its profit on the difference. When the plant was connected to the grid in November 1929, it was considered the technology of the future. Now the power plant, along with the recreational lake attached to it, could soon be gone. The company plans to shut down the energy storage facility within the next two years. This is bad news for Dresden's swimmers, but it's especially detrimental to Germany's energy transition, which depends on backup power plants like the Niederwartha facility. When the sun isn't shining and the wind isn't blowing, gas-fired power plants and pumped storage stations are supposed to fill the gap. A key formula behind the Energiewende is that the more green energy is produced, the more reserves are needed to avert bottlenecks. This is true in theory, but not in practice. On the contrary, an ironic result of the green energy expansion is that many of the reliable pumped storage stations could be forced out of the market. There are roughly 20 of these power plants in Germany, with Vattenfall being the most important operator. The plants were very profitable for utilities for decades, but now the business has become highly unreliable. Dresden is a case in point. When it's sunny and people are most likely to head to the lake, solar power is abundant and electricity prices drop. This means the pumped storage station earns less money, so the power plant is shut off. In 2009, for example, the turbines in Niederwartha were in operation for 2,784 hours. Last year, Vattenfall ran the facility for only 277 hours. "Price peaks that last only a few hours aren't enough to utilize the plant to full capacity," says Gunnar Groebler, head of Vattenfall's German hydro division. Danes being driven insane, cry: “enough is enough”. Denmark is the home of struggling Danish fan maker, Vestas – an outfit that – after our Wind Power Fraud Rally in June 2013 – paid $millions to a crack team of Australian propaganda parrots to invent a campaign aimed at winning back the “moral” high ground. It called its new public relations model “Act on Facts” – we covered some of their “facts” in this post. Danes complain about precisely the same effects from the incessant turbine generated low-frequency noise and infrasound that Vestas’ victims at Macarthur in Victoria do (see our posts here and here). Now, the Danish government has gone into legal liability damage control by refusing to issue any further permits for wind farms. Here’s NoTrickZone on the Danes’ latest lament. Under Fire Due To Health Impacts From Infrasound … Danish Permitting Halts! Beleaguered Industry: Wind Parks Coming Under Fire Due To Health Impacts From Infrasound … Danish Permitting Halts! The debate on the effects of infrasound on the health of people and animals living near wind parks has been raging on with more intensity than ever – especially since Denmark unexpectedly halted the permitting of new wind parks due to “health concerns” from infrasound. Infrasound is defined as low frequency sound under 16 Hz – below the threshold of human hearing. Wind farms are notorious for generating these potentially harmful sub-audible frequencies. It is said that infrasound can be sensed as pressure to the ears or to the stomach, or as a slight vibration. There’s a Swedish report available on the hazard, click here. It calls for the legal framework for the creation of wind parks to be revised. German NTV public television reports recently that in Denmark mink farm operator Kaj Bank Olesen from Herning is a neighbor to four large-scale wind turbines only 330 meters away. Olesen and other neighbors had protested the planning of the wind turbines, fearing negative consequences from their noise and shadows. However the community rejected their claims, basing it on a lack of credibility. The turbines were installed. Now it seems that Olesen’s earlier fears may have had merit as he claims that the infrasound generated by the turbines are making the mink animals on the farm aggressive and is leading them to die. After one night he found 200 dead minks the next morning. The incident has since sparked the Danish government to take action. Permitting of wind parks in Denmark is now on hold. The alleged health impacts from wind turbines have been making the news (0:55) in Germany as well. In Schleswig Holstein, Germany, the Hogeveens have been forced to sleep and eat in their basement in a desperate attempt to find refuge from the maddening infrasound emitted by recently installed turbines near their home. The wind industry and many government authorities deny there’s a connection between infrasound from wind turbines and health impacts on humans. Hermann Albers of a wind lobby group says there’s no connection between the turbines and the irritation sensed by those living close by, claiming that it is a “subjective” perception or that it’s “politically motivated”. In other words, people living close to wind turbines are just making it all up and they should instead just shut up and live with it. The German government says it will study the matter further and consider if infrasound should be taken into consideration during the wind park permitting process. Data from comprehensive studies are difficult to come by. Wind farms are reluctant to share their data with researchers, fearing unfavorable results and consequences. The impacts from infrasound on human health will continue to be debated in the future. But other things are already sure and beyond debate: Wind farms are rapidly losing their attractiveness and support from the public due to their poor performance, hazard to birdlife, ruining of property values, and their blighting of the natural landscape. An adverse connection to human health would be yet another large nail in the coffin of the now increasingly controversial wind industry. Hat-tip: Wolfgang Neumann at Facebook. In the piece above it’s said that “Permitting of wind parks in Denmark is now on hold“. STT’s Danish operatives have confirmed that that is, indeed, the case. Not that you’ll read about in the Australian press; or see or hear it on your ABC. In liability terms, governments that continue to allow turbines to be speared into peoples’ backyards, or which fail to shut them down wherever neighbours can’t sleep, are sitting ducks as defendants in negligence actions. The evidence of harm and personal injury is clear enough; and those in power can no longer claim to be unaware of it (seeour post here). Now, it seems that the Danish government is also out to draw a line between it and the wind industry; if only in an attempt to quarantine its liability to thousands of its victims. It was due to Vesta’s corporate malfeasance and insidious institutional sway that Denmark became the birthplace for the great wind power fraud in the first place; and, thereafter, became the Mecca for the wind industry’s cult-like followers. STT thinks that it’s fitting, in its way, that this despicable industry and its worshippers have their “Doomsday” in Denmark.